Water damage is a serious issue that must be taken care of as soon as possible. Do not hesitate if your home has undergone water damage. Acting fast can save your possessions, time, and money. KIWI Services in Copperfield has provided excellent water damage restoration for 30 years making us the best choice for your water damage needs. 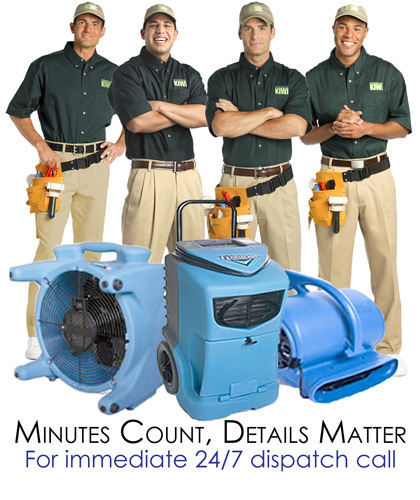 KIWI offers 24/7 water damage repairs in Copperfield. If your home is suffering from water damage at 2 AM, do not hesitate to call KIWI. We will send out a water damage restoration team right away. KIWI knows the importance of acting against water damage as soon as it strikes, so that’s why we offer quality service at all times. All of our water damage repair technicians are professionally trained and expertly skilled. KIWI is able to do all kinds of water damage repairs from extracting all water to repairs on carpets, rugs, and floors. KIWI also offers a one-year carpet cleaning warranty for any carpet work done. KIWI wants you to feel that you are in trusted in hands during your water damage restoration. Our representatives and technicians are there for you during this process. We offer a one-year water damage guarantee on all work done and we will work with your insurance to help cover costs.